By Sadiq Umar – Former President Goodluck Jonathan has fired back at the National Chairman of the All Progressives Congress (APC), Adams Oshiomhole, saying the former Edo State governor is “suffering multiple personality syndrome”. In a statement by his spokesman, Ikechukwu Eze, the former president noted that vote buying began in the Edo state 2016 gubernatorial election, a year after Jonathan had vacated office, and could not be linked to him. In a statement titled ‘Oshiomhole: The burden of blame game and tumultuous leadership’, Mr. Jonathan described the accusation as misleading. He said many credible elections were held under Jonathan’s government and Oshiomhole was one of those who commended the processes. “We really do not know the real reason for this misleading falsehood, at this point in time. However, we can only guess that Mr. Oshiomhole who is currently operating under tremendous stress in the bid to steady the already floundering ship of his administration as the new leader of his party, may have got himself entangled in a voyage of tactless desperation,” the statement read. “His recent flip flops where he praised Governor Samuel Ortom and Senator Rabiu Musa Kwankwaso one day only to denounce them the very next day, is enough evidence of his fragile psychological state. 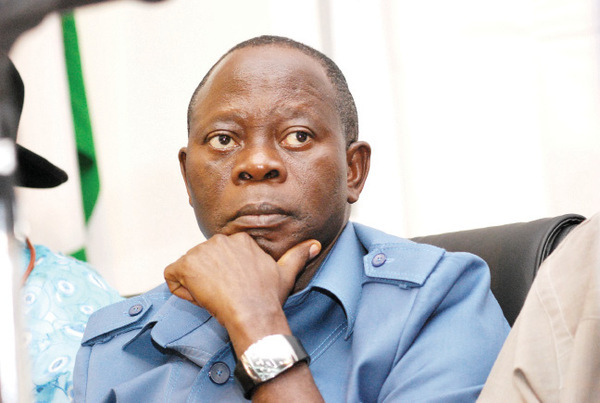 “It appears that Mr. Oshiomhole’s psychological strain may have reached boiling point. “On the vexatious issue of ‘vote-buying’, which has unfortunately found its way into our election lexicon, this is what we know: It is obvious that the shameful development in our democratic experience became very glaring during the 2016 gubernatorial elections in Edo State; an exercise that took place more than one year after President Jonathan had left office. It is therefore disingenuous for any politician or group to link the former President with the anomaly, no matter how they want to stretch the now-failing blame game. “While in Office as President between 2010 and 2015, Jonathan conducted many elections including the 2011 and 2015 general elections, and many off-season gubernatorial and parliamentary elections in some states like Anambra, Ekiti, Ondo and Edo; and not for once did the issue of vote buying come up in the assessment of those elections. It is instructive that in each case, the former President was given a clean bill, with both local and international observers commending him for having supervised a credible and transparent process. “One of those who gave the former President a clean bill of health, was Mr. Oshiomhole himself who on July 16, 2012 said: “What the Edo election has confirmed is that when the President and Commander-in-Chief puts the country first and he conducts himself as a statesman not just as a party leader, credible elections are possible. “When you juxtapose the above statement with Mr. Oshiomhole’s current statement, it becomes obvious that the APC Chairman is suffering from multiple personality syndrome and has a Jekyll and Hyde schizophrenia,” he added.